The Warehouse will be home to the GRO Bloomington Skateboarding Program. This seven-week program will take place each Thursday from 6:00 – 7:00 PM. 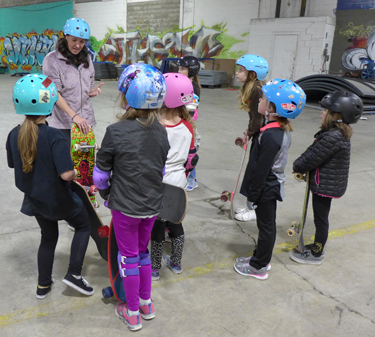 Over the course of the program, students will learn about skateboarding equipment, safety, how to fall, how to ride, the many types of riding and how to navigate skateparks. Learning to ride promotes fun, fitness, strength and self-confidence. This program works through a series of classes that build on the prior class so attendance is important to keep up with the group and maintain safety. Here you can become a mentor, or learn about skateboarding in a positive and comfortable environment with a group of girls. Learn how you can get involved by volunteering, taking photos or videos to share the story of the Bloomington, IN GRO and other ways too. 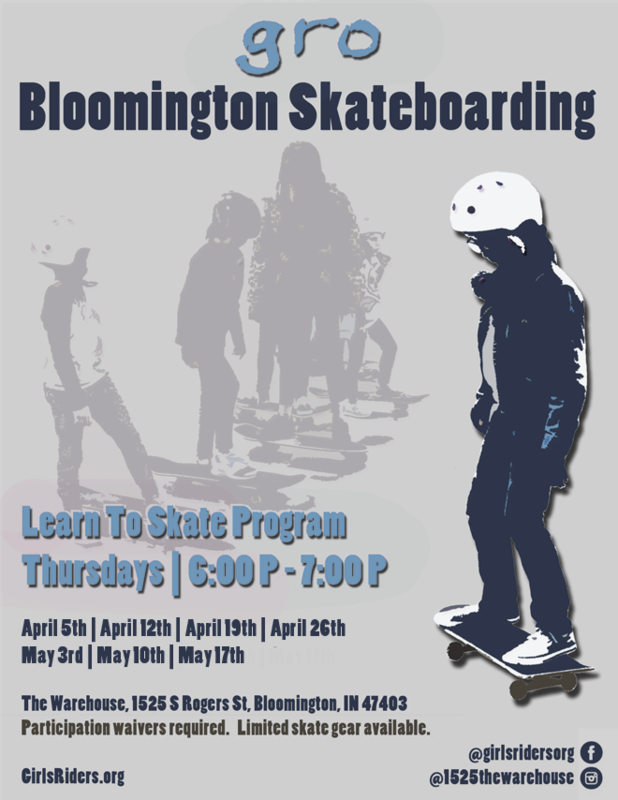 Girls of all ages and all skateboarding abilities can come together at this event to grow both through skateboarding and creating goals for this crew of girls and how they can make an impact on the Bloomington Community! Suggested $5 donation to participate in the program instruction. There is no cost to skate the park. All minors will need to have a parent present to sign in to skate. All participants need to wear skateboard shoes or other tennis shoes, preferably with flat soles. There will be some skateboards and safety gear available to borrow, but please bring your own if you have it or can borrow a friend’s to allow as many people as possible to take part.